Link to the original post reviewed fresh off draft at The Brockway Pub for GFJ (Grapefruit Jungle) - 2012. Differences between 2012 and 2013 brew? The only notables I can taste/see are the lightening of the lacing affect, polishing of the huge grapefruit finish and slight reduction in the length of time the finish sticks around. Other than that? Same great brew! ONLY THIS TIME IT'S IN CANS! I still stand by my previous 4.5 and review. Cheers, and get it while it lasts! If you are interested in the Big Brother (DIPA) to GFJ, check out our post on Jungle Room! FUN Fact: GFJ was canned once before in September 2011. 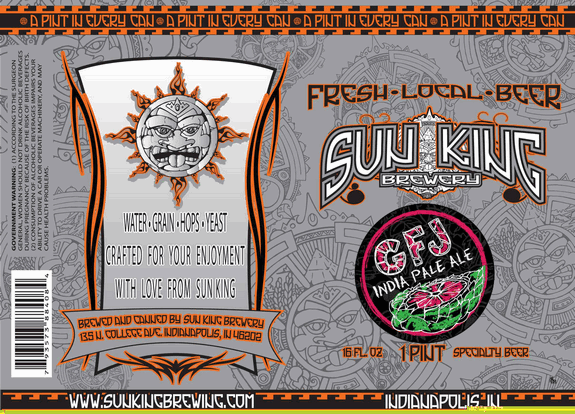 A limited release that utilized the classic aluminum can design of Sun King Brewing with a small Half Dollar sized sticker used for identifying it. The Big Guy: My tastes have totally changed in the last year. I look at O's post from last year and see that I only gave GFJ a 3. After trying IPA after IPA and really figuring out what I like, I would have to give GFJ a solid 4. It is citrusy in all the right ways. Just sweet enough to even out the bitter hops that really hit you on the front of the beer. The sour grapefruit tastes lingers just a little bit at the end of the beer and it's outstanding! Last year I only got this one on tap, but after having it on tap and canned this year, I'd have to say there is little to no difference. Its as good fresh as it is newly canned. Get out there and drink it! I was fortunate to get a bunch of those first cans in 2011 and was really disappointed they abandoned their plans to can it in 2012, so of course when it came out in 2013 I did whatever I could to get as much as possible. I think you gotta be careful here to not contradict yourselves. In the review of Permanent Funeral I believe Owen gives PF a 5 rating and says that it "rivals GFJ"....but here you gave GFJ a 4.5 which contradicts your point of rivaling beers.....maybe clarify that you like PF better in that post?